The title of this post was taken from the song You'll Be In My Heart by Phil Collins. Father's Day is tomorrow. Last year, I remember dreading it but, thinking about it now, I have no idea what we did. I guess I need to go back and read my blog to see. I have a lot on my mind and I'm going to try and organize it into some semblance of a coherent, well-thought-out post. My dad is amazing. He is one of the most selfless people I know. My whole life I have watched him serve others and do so humbly. His work ethic is impeccable and he always took time to teach us as he worked. He was strict on us growing up. The word "gross" was one we did not utter in our home; it was just a word he disliked. Dad worked hard to make sure that we never lacked anything. We took family vacations every summer and I remember having a computer in our home when we I was ten. It was an old Tandy 2000. Dad is organized, prepared, and always knows how to handle the most difficult situations. He never speaks a bad word about anyone no matter what they have done to him. I could go on and on. My whole life I've known that if I needed anything dad would be there for me and he'd do everything he could to make things better. Dad is not one to cry but when Mike passed away I remember watching tears roll down his cheeks as his heart broke for the loss we were enduring and for the pain his daughter was in. I love my dad more than words can say. I still hold his hand when we walk together in a store and yes I still call him "Daddy." Never has there been a child who loved their father more than I love mine. Happy Father's Day Dad! I struggle with how to handle Father's Day for the kids. We talk about Mike all the time...but I know that talking about it during times like this is a little harder than it is during others. We will go to church tomorrow and the kids will get up with the other primary kids and sing a song to their dad. I wonder how that makes them feel; knowing that their dad isn't physically there to hear what they are singing. This year Tyler is singing a special song with a friend and she's been working really hard on it. It's a surprise and she refuses to talk to me about it. Whatever it is, I'm grateful because it's given her something positive to focus on. I'm also grateful for those that have helped her with this. Mike's favorite job in the whole world was being a dad. He loved the kids so very much and making them happy was his main goal in life. We aren't perfect and, of course, they often pushed his buttons but nothing they did could ever change how he felt about them. They were his entire world. Likewise, the kids love him. We often talk about the good times; the silly things they would do that would drive him crazy; and the special moments they shared with him. I think knowing that they can, and should, talk about him anytime they want to has been therapeutic for them. The kids understand that there will be times when talking about it makes me sad, or even them but most of the time he's simply a part of our daily conversations. I love that they are comfortable with this. 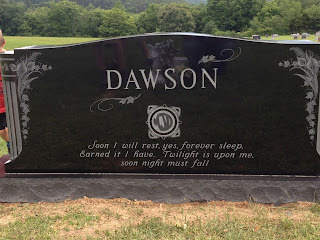 We went to the cemetery yesterday and the headstone has been set. I'm sharing several pictures. 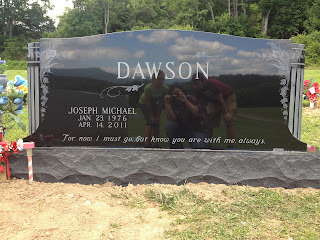 The first one shows our reflection in the granite. The stone itself does not have clouds or us on it, lol. Although it is kinda cool looking. 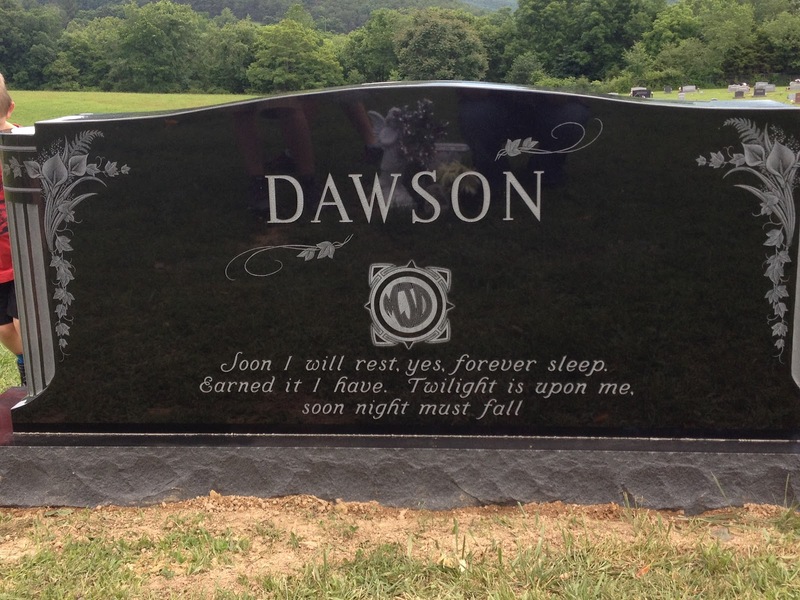 The quote on the bottom reads, "For now I must go, but know you are with me always." I took it from a letter Mike wrote me a long time ago. This is the back of the stone. It has his artwork on it and the quote is from Star Wars...Yoda to be exact; it reads, "Soon I will rest, yes, forever sleep. Earned it I have. Twilight is upon me, soon night must fall." Here is a close up of the art work. 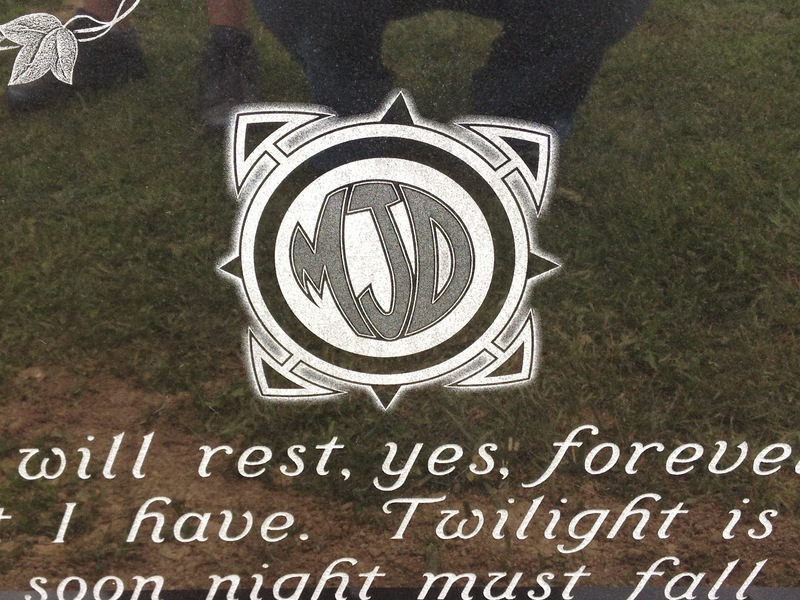 He drew this at work and someone recreated it for me so that I could put it on the stone. Our initials were interchangeable (JMD and MJD). We closed on the house Thursday. We will be moving as soon as the previous owners are out. In spite of all we have been through, I can't help but feel blessed at this very moment. We've lost so much but, through that loss, we have gained much. Our priorities are where they need to be. We have pulled together as a family and now, more than ever, we stay focused on the things that matter most. I've learned to have more faith and to trust in the plans my Heavenly Father has for me...even when I'm not sure what they are. I've found someone who loves and cares about me and truly makes me happy. John is so completely understanding about everything and never bats an eye when I have crazy moments. 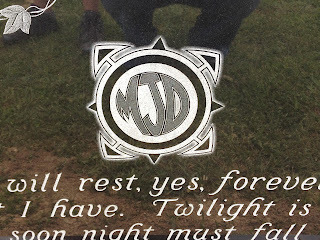 His gentle support as we stood looking at Mike's headstone gave me a peace beyond anything else, most importantly, it gave me reassurance that, while we have been through something horrific, there is still room in my life for love and happiness.